How to Back Up iPhone/iPad/iPod before Upgrading to iOS 11? For Apple fans, the most exciting moment is coming soon – Apple will release the new iPhone device and iOS version in September, just as it did in the past years. And there is no need to describe or imagine how fantastic the new iPhone device – iPhone 8 and iOS version – iOS 11 will be. There are too many guesswork and rumors about their new features in various technical websites. But what you cares more is probably that how to back up your iPhone, iPad or iPod touch before upgrading to iOS 11. We all know how important the existing data on our device is. But losing data during iOS update is so common and to back it up for safety is definitely necessary before you updating to new iOS. The article shows three free methods about how to back up iPhone/iPad/iPod before upgrading to iOS 11.
iTunes is the free method offered by Apple itself to back up and restore iPhone/iPad/iPod touch data. To back up your iOS device to iTunes, you will need a computer installing the iTunes. And then, follow the steps below. Step 1. Launch iTunes and connect your iOS device to your Windows or Mac computer. If you never connect your device to the computer, you will need to trust the connection from your device first. Step 2. Click your iPhone, iPad, or iPod icon when it appears in iTunes. If you need to save your Health and Activity data on device, you will need to encrypt the backup. But if you don’t need to save it, just click Back Up Now. Step 3. iTunes will take a while to back up the data and settings on your device to the computer. After that, you can check whether the backup is completed by going to Edit > Preferences > Devices. 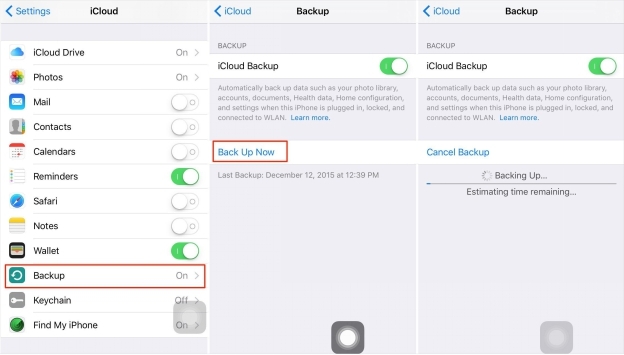 You can also back up your device to the air – iCloud. 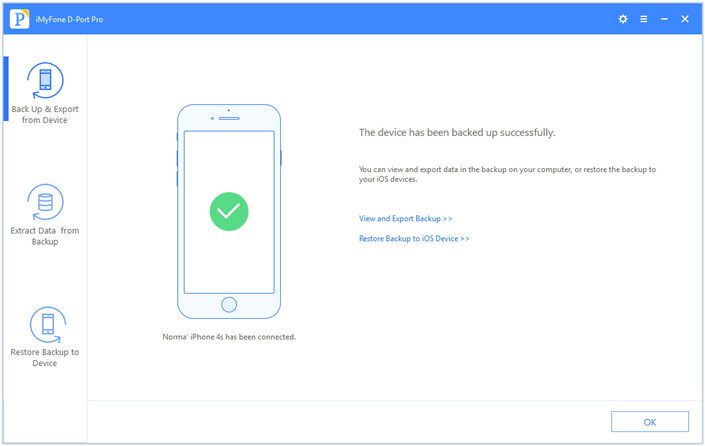 iCloud is another good service Apple offers to allow users back up their iPhone, iPad and iPod touch. You don’t need to install any software to computer – your device has iCloud already. What you need is the Wi-Fi network. See the steps. Step 1. Go to Settings > Your Name > iCloud if you are using iOS 10.3 and later versions. For earlier versions, just go to Settings and then scroll down to choose iCloud. Step 2. Tap iCloud Backup. If you're using iOS 10.2 or earlier versions, tap Backup. Make sure that iCloud Backup is in the state of turning on. Step 3. Tap Back Up Now. Note that the Wi-Fi network works smooth until the backup process completes. Step 4. After backing up, Go to Settings > Your Name > iCloud > iCloud Storage > Manage Storage, then select your device to check whether the backup is completed. For iOS 10.2 or earlier versions, just go to Settings > iCloud > Storage > Manage Storage, then select your device to confirm. There are also third-party apps can back up your iOS devices. Here will introduce iMyFone D-Port Pro to you. The program can easily back up and restore iOS content without the need for iTunes. See what it can do for you. What can iMyFone D-Port Pro do for you? 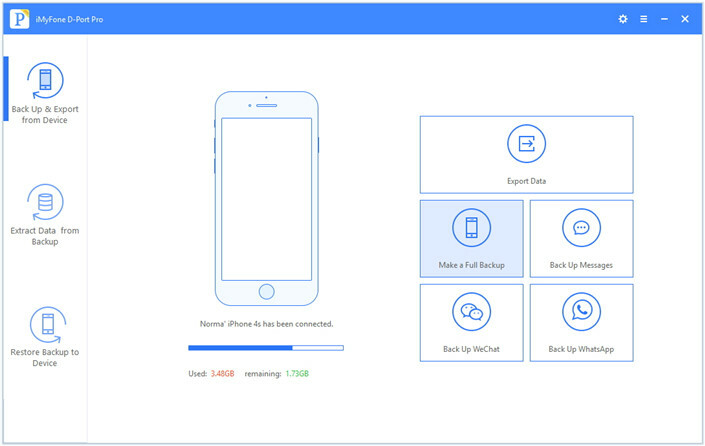 Create complete iOS backups of your iPhone data, including notes, photos and videos, SMS and iMessages, WhatsApp conversations and device settings. You can save the path to store the backup – you can store it to a USB flash drive or an external hard disk. 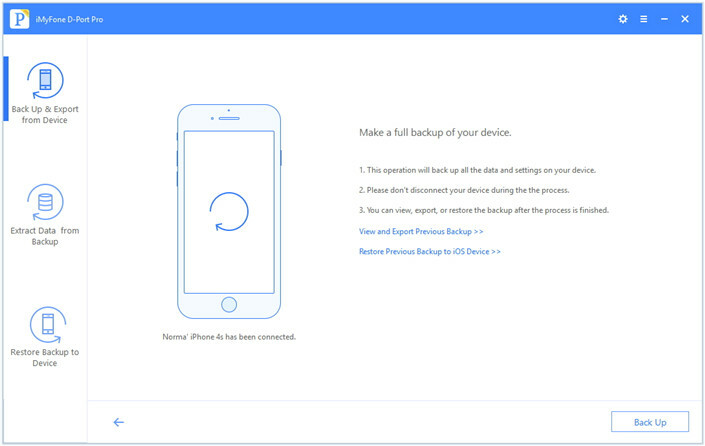 You can use the program to restore your backup to your new/other iOS devices. How to Back Up iOS Devices with iMyFone D-Port Pro? Step 1. Download and install iMyFone D-Port Pro. Run the program and connect your iPhone, iPad and iPod touch to your computer. 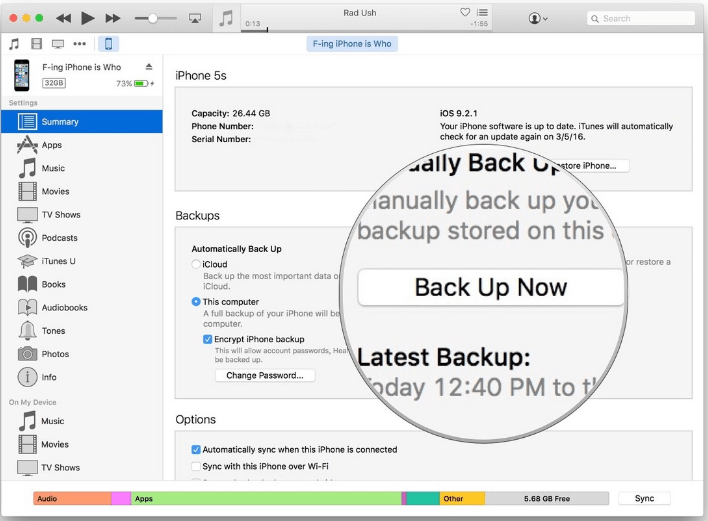 Click on the Back Up & Export from Device tab and then choose Make a Full Backup. Step 2. Then the program will tell you what you should notify before backing up your device. Step 3. Click Back Up to begin the process. It will need some time which depends on there is how much data on your iPhone/iPad/iPod touch. After the backup completes successfully, just click Done. Now you know three methods to back up your iPhone, iPad or iPod touch before upgrading to the latest iOS 11. Just do it to avoid any data loss during the update!